I think I am quite handicapped when it comes to handling flour but there are some recipes with flour as an ingredient which I have mastered. Roll out the dough until flat on a cleaned and floured work top. Using the top of a round bowl, cut out circles big enough to cover each egg and gently place each boiled egg into each circle. 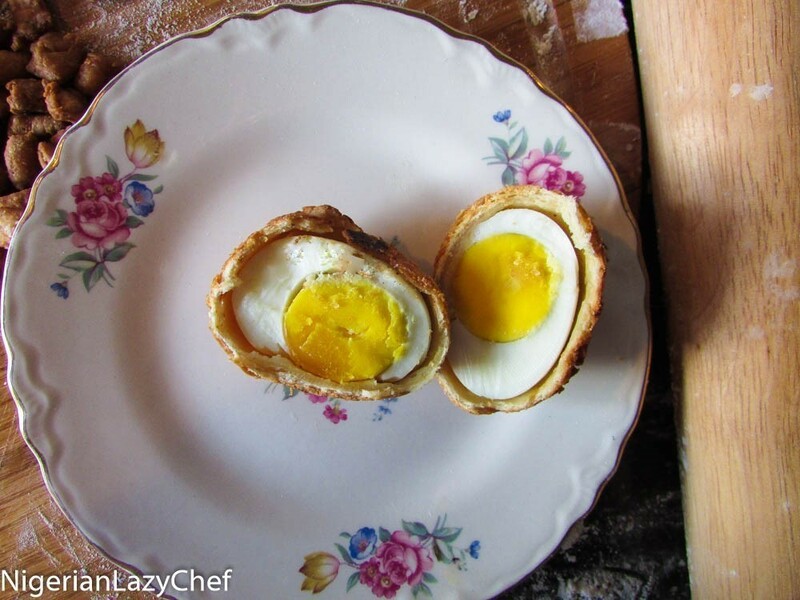 Wrap the egg with the already cut out dough, while neatly covering it. 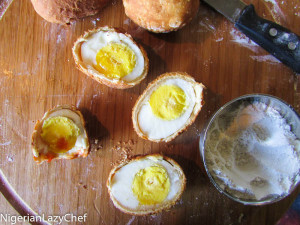 Smoothen out the dough covered egg with the palm of your hands and place it into a plate and into the refrigerator for about an hour. This entry was posted in Appetizers, Egg rolls, Eggs, Nigerian egg rolls, Nigerian snack, Small chops, Snack and tagged African snack, Egg rolls, Nigerian egg rolls, Nigerian snack, Nigerian street food, snack. Please how much sugar am i suppose to use. Thank you. Cn I use peak milk? love it. will try this for Easter! Hi Ugochi. Please let us know how it goes. Happy Easter! well done Nma. I tried the eggroll today and I loved it. The recipe was very easy to follow. Nice on nma pls can I mix yeast n baking power n put? Nma, I appreciate ur effort. Pls i’m I to mix baking powder in water before pouring into d dry mixture? So I tried to make these eggrolls, and long story short the dough is looking weird, as in not well fried. I don’t know if I can re-fry them, or try using an oven to bake it and see how it turns out? I tried baking them, but it didn’t help. Ended up throwing them away. I’ll just have to give it a try again! Hi Tosin. I’m really sorry about that. I’ll say rest a bit and give it another try. 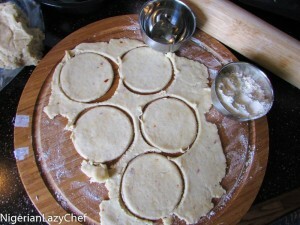 Make sure your dough is not puffy when you roll it, so it can cook through. Have a happy new year! Pls what makes your egg roll dry..? Hi Precious, please could you rephrase the question?